Market-leading 5-year shell replacement warranty. Rugged, high-temperature edge trim will not melt or drip. Easy front headband adjustment for proper SCBA mask fit. Simple rear ratchet height adjustment to fit all head sizes. Headband (63⁄8 to 83⁄8) fits a wide variety of head sizes. Durable helmet hanger fits on large hooks and resists bending. Exclusive shell release system for an extra margin of safety. Unique tube-lock system absorbs the shock of an impact. The Biggest difference between the Cairns 1010 and the Cairns 1044 is that the Cairns 1010 is painted over the the Dura-Glas and with the Cairns 1044 it is the actual Dura-Glas color. Exclusive dura-glas, chip-resistant through-color. High-performance, high-heat-resistant compression-molded fiberglass composite shell. A tough, through color, DuraGlas fiberglass and high-temp composite resists cracking and chipping and provides a perfect combination of durability and performance in a lightweight, high-performance design. Features a non-corroding, high temperature, glass-filled polymer faceshield/goggle hardware. The ultra high temperature (TPR) edge trim will not melt or drip. A Nomex chinstrap with one-hand quick release buckle and postman slide allows quick and easy adjustment. A choice of Nomex or Pbi/Kevlar earlap increases neck/ear coverage and protection and the patented shell release increases neck and head protection. A high-temperature foam cap increases thermal and impact protection and a higher temperature impact cap liner resists distortion at higher temperatures. An exclusive SCBA interface front headband adjustment matches the fit of any SCBA mask and the three-position rear ratchet height adjustment ensures a secure and comfortable fit for all head sizes between 6-3/8 and 8-3/8 inches. A choice of flannel or leather cushion liners, removable for washing and upgrading, provides greater ease and comfort. 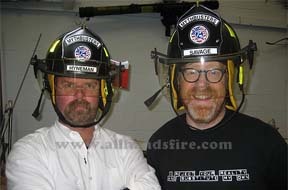 Cairns & Brother has over 160 years of experience in manufacturing structural firefighting helmets.